I'm not one for processed food, but sometimes I get busy and need a quick and healthy protein. And for that, I usually turn to Life Choices' Chicken Nuggets. I love these nuggets! First of all they are made from free-range, responsibly raised chicken without hormones or antibiotics. For the past 4 years I've been eating mostly vegetarian, but I occasionally do eat chicken. And when I do, it's always responsibly raised (either from Life Choices or from Whole Foods). I figured if I'm only eating organic, I also need to be consistent with my meat, and only eat healthy, chemical-free animal products. The other reason is that I love the taste of these nuggets! I was invited by some friends to a popular local restaurant last year, where I tried a chicken dish. Oh how I regretted it! The chicken felt completely tasteless! And to make it worse, the consistency was very unpleasant: it felt like I was biting a rubber sole. It reminded me of why I never eat out. 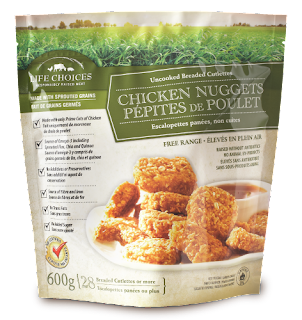 Life Choices' Chicken Nuggets, on the other hand, have real chicken taste. The difference is amazing! They are soft and crunchy. Once again, I realised how spoiled my palate has become. The price is a bit high (about $14 in Loblaws in Ontario), but if you wait for them to go on sale, you at least get the best deal you can find ($9). Whenever this goes on sale I usually stock up on 2-3 packages. I love these nuggets and will continue buying them as long as they keep making and selling them. I highly recommend them to anyone who wants to eat healthy or even, those who are vegetarians due to animal welfare concerns.